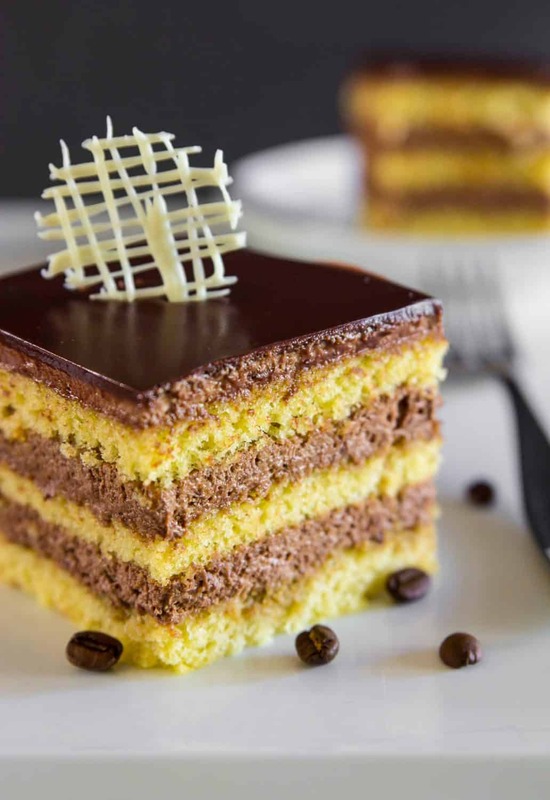 This easy opera coffee cake is everything! The sponge cake is made with almond flour and melted butter, which gives it an incredibly moist texture. The filling is a rich chocolatey cream infused with coffee flavor. A velvety chocolate ganache covers the entire cake for the ultimate chocolate lovers dessert. 1 . Sift almond flour, baking powder, and all-purpose flour into a bowl and set aside. 2 . In the bowl of a stand mixer, beat 10 eggs on high speed for about 4-6 minutes or until the eggs are light and fluffy. Mixing time may vary according to your mixer. 3 . Continue beating on high speed as you add the sugar to the eggs. Mix for an additional 4-6 minutes. 4 . Gently fold 1/3 of the flour mixture into the eggs using a spatula. Once it’s mixed in well, repeat this 2 more times (1/3 mixture each time). Careful not to over mix. 5 . Using a whisk, gently mix the melted butter into the eggs. Make sure to scrape the bottom of the bowl as you mix. 6 . Line a 19 x 13 inch rimmed baking sheet with parchment paper and lightly coat with cooking spray. Spread the cake batter onto the baking sheet. 7 . Bake at 350 degrees Fahrenheit for 15-20 minutes or until the cake becomes golden in color. 8 . Let the cake cool completely on a cooling rack. Then cut it into 3 equal pieces. So you’re left with 3 ( 6 1/2 x 13 inch pieces). 9 . Melt 2 cups semisweet chocolate chips until smooth. 10 . In the bowl of a stand mixer beat 3 cups heavy whipping cream, espresso powder, and sugar on high speed until stiff peaks form. Make sure not over-beat or you’ll end up with coffee butter. 11 . Gradually add the melted chocolate chips while the mixer continues to beat the heavy cream. Mix until the chocolate is well incorporated. 12 . Mix 1 1/2 tsp instant espresso powder with 1 cup hot water and 1 tbsp sugar. This will be the coffee syrup. 13 . Begin assembling the cake by placing 1 of the 3 cake pieces on parchment paper. Using a pasty brush lightly brush the spongecake with coffee syrup. 14 . Spread about 1/3 of the chocolate filling on top of the first spongecake layer. 15 . Place the second spongecake on top and repeat steps 13 & 14. 16 . Place the third spongecake layer on top and repeat steps 13 & 14. This time the entire outside of the cake will be covered with the chocolate filling. Place the cake into the refrigerator for at least 2 hours. 17 . Meanwhile, prepare the ganache. Fill a saucepan with about 2 inches of water and bring it to a simmer. Place a heatproof bowl on top of the saucepan and add 12 oz of semisweet chocolate chips. 18 . 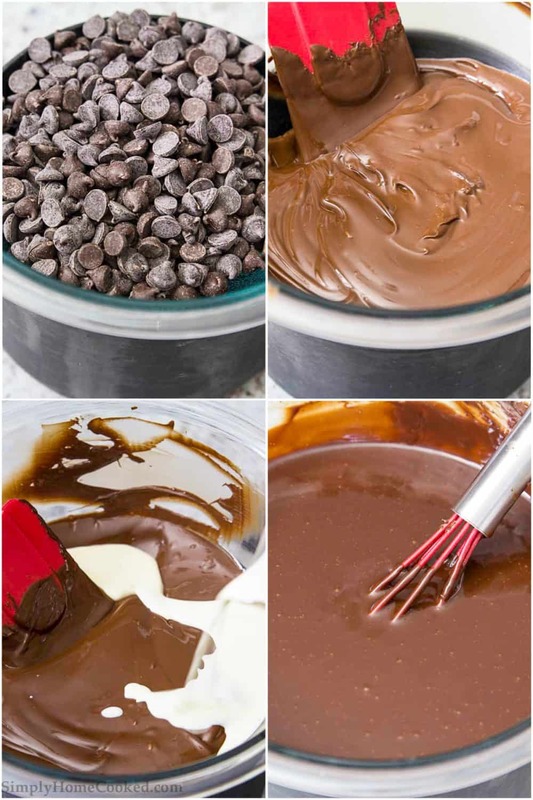 Stir the chocolate chips with a spatula until they are melted. Then very slowly stir in 1 1/4 cup heavy whipping cream. 19 . Once the heavy whipping cream is mixed in well, add 6 tbsp sliced butter. Once the butter is melted, mix in 6 tbsp honey. If you end up with small bits of chocolate strain the chocolate through a mesh strainer to ensure a smooth ganache. 20 . Transfer the refrigerated cake onto a wire rack with a rimmed baking sheet under (to catch all the leftover ganache). Pour the chocolate ganache over the cake and let it set in the refrigerator for an additional 4 hours. Once the ganache has set, you can leave the cake as is or slice off about 1/4 inch off each side of the cake so all the layers are exposed. Sift almond flour, baking powder, and all purpose flour into a bowl and set aside. 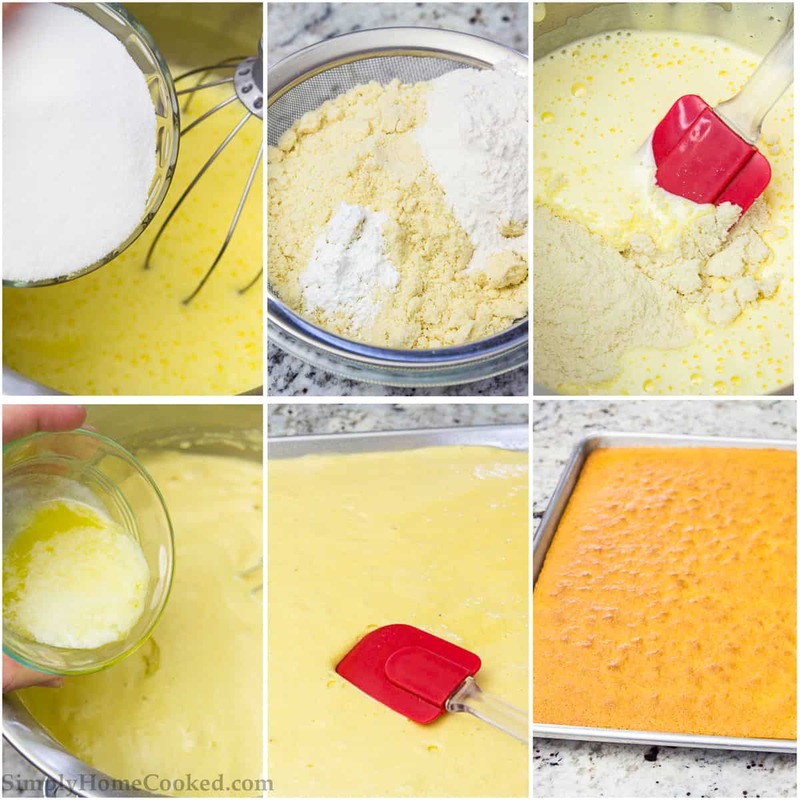 In the bowl of a stand mixer, beat 10 eggs on high speed for about 4-6 minutes or until the eggs are light and fluffy. Mixing time many vary according to your mixer. Continue beating on high speed as you add the sugar to the eggs. Mix for an additional 4-6 minutes. Gently fold 1/3 of the flour mixture into the eggs using a spatula. Once it's mixed in well, repeat this 2 more times (1/3 mixture each time). Careful not to over mix. Using a whisk, gently mix the melted butter into the eggs. Make sure to scrape the bottom of the bowl as you mix. Line a 19 x 13 inch rimmed baking sheet with parchment paper and lightly coat with cooking spray. Spread the cake batter onto the baking sheet. Bake at 350 degrees Fahrenheit for 15-20 minutes or until the cake becomes golden in color. Let the cake cool completely on a cooling rack. Then cut it into 3 equal pieces. So you're left with 3 ( 6 1/2 x 13 inch pieces). Melt 2 cups semisweet chocolate chips until smooth. In the bowl of a stand mixer beat 3 cups heavy whipping cream, espresso powder, and sugar on high speed until stiff peaks form. Make sure not over-beat or you'll end up with coffee butter. Gradually add the melted chocolate chips while the mixer continues to beat the heavy cream. Mix until the chocolate is well incorporated. Mix 1 1/2 tsp instant espresso powder with 1 cup hot water and 1 tbsp sugar. This will be the coffee syrup. Begin assembling the cake by placing 1 of the 3 cake pieces on parchment paper. Using a pasty brush lightly brush the spongecake with coffee syrup. Spread about 1/3 of the chocolate filling on top of the first spongecake layer. Place the second spongecake on top and repeat steps 13 & 14. Place the third spongecake layer on top and repeat steps 13 & 14. This time the entire outside of the cake will be covered with the chocolate filling. Place the cake into the refrigerator for at least 2 hours. Meanwhile prepare the ganache. Fill a saucepan with about 2 inches of water and bring it to a simmer. Place a heatproof bowl on top of the saucepan and add 12 oz of semisweet chocolate chips. Stir the chocolate chips with a spatula until they are melted. Then very slowly stir in 1 1/4 cup heavy whipping cream. Once the heavy whipping cream is mixed in well, add 6 tbsp sliced butter. Once the butter is melted, mix in 6 tbsp honey. If you end up with small bits of chocolate strain the chocolate through a mesh strainer to ensure a smooth ganache. Transfer the refrigerated cake onto a wire rack with a rimmed baking sheet under (to catch all the leftover ganache). Pour the chocolate ganache over the cake and let it set in the refrigerator for an additional 4 hours. 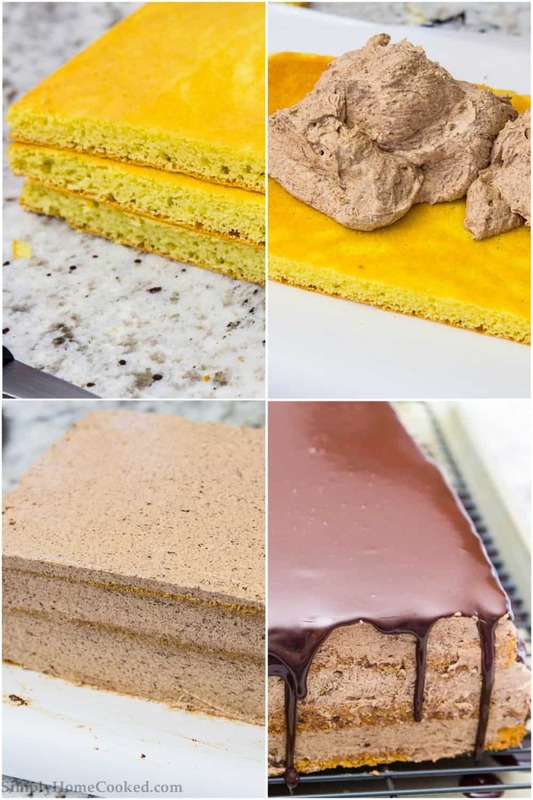 Once the ganache has set, you can leave the cake as is or slice off about 1/4 inch off each side of the cake so all the layers are exposed. 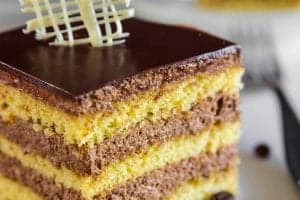 What baking sheet would you recommend if I need to make the cake in double portion? I need to feed 30 guests. The original recipie will only serve 10? Hi Lili, I used a 19×13 inch rimmed baking sheet. So you’ll want to use 3 (19x13inch) baking sheets to triple the recipe for 30 guests. hi, can i freeze this cake? Hi Olga, yes you can freeze this cake. I made this and used it for guests two nights in a row. I cut an good sized rectangle that would be just enough for the group I had. I covered it with ganache about half and hour before serving. And kept it refrigerated as much as possible. This cake, in my opinion, is best COLD. I loved it cold. So delicious! I will be making this again because of how clean and elagant it looks. And of course the taste! Btw, I totally baked the cake in the wrong sized pan (12X18), and it still turned out great! Just had to do more cutting but it was manageable. I had four layers instead of 3. Yes, Anna this cake can be made a few days in advance. If you plan to slice the edges of the cake off (for a cleaner look). Don’t slice the edges off until the day you plan to serve it. It will also cut a lot easier when it’s refrigerated. I made this cake and the dough too thicker , doesn’t turns good to me. I put 2cups plus 1/2 cups almond flour and 1/2 cups all propose flour those dry ingredients together Do u think too much ? Hi Lucy, if you followed the recipe, it shouldn’t be too thick. Maybe you under beat the batter?